Whether or not you are an amateur of Formula I races, you’ll love Iain & Margaret’s last “Letter from Scotland” in which our dear friends tell us about the fascinating story and tragic destiny of Jim Clark, nicknamed “The Flying Scotsman”, one of the greatest motor-racing champion in the world and a national hero in Scotland. Bonne Année 2019 – Happy New Year ! 🙂 As we look back on a year that has been quite eventful – gilets jaunes in France, and here in Britain the long fight over Brexit – we’re very happy once again to send you our greetings from Scotland ! Our understanding is that the ‘yellow vest’ demonstrations – which grew so rapidly to reflect wider discontent, leading to violent disorder and huge destruction of property – had begun as a protest against the steeply rising price of diesel fuel for cars. In France as in Scotland, we would guess – and especially in small towns and in the rural areas – there is a strong feeling that the local economy is in decline. Shops, schools, and facilities of all sorts are closing, and people find that being able to afford a car is essential to maintaining their standard of living. 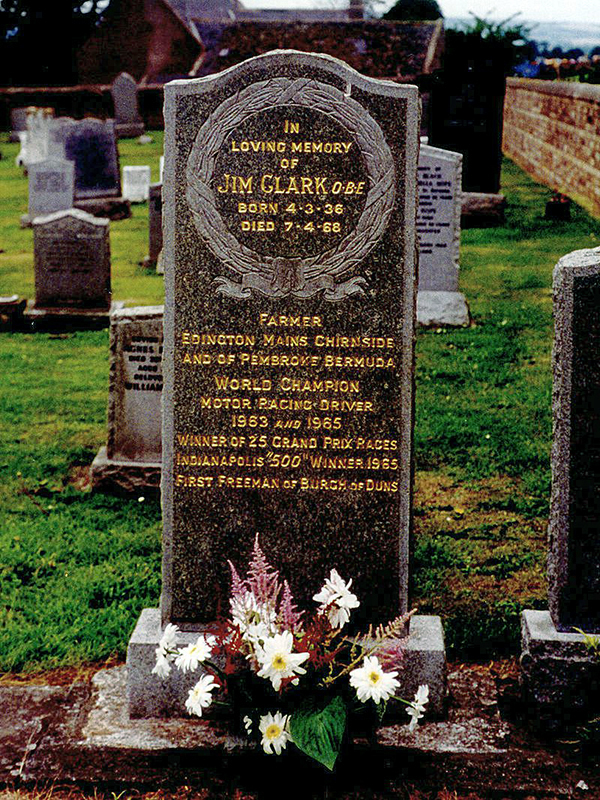 It was while driving through Duns in the Scottish Borders that Margaret and I decided to make a point of seeing the village of Chirnside before heading home, as we knew that it holds the last resting place of Jim Clark (1936-1968), the world-famous racing driver. A surprisingly large village, but with an air of antiquity about it, Chirnside sits on a hillside close to the main road for Berwick. 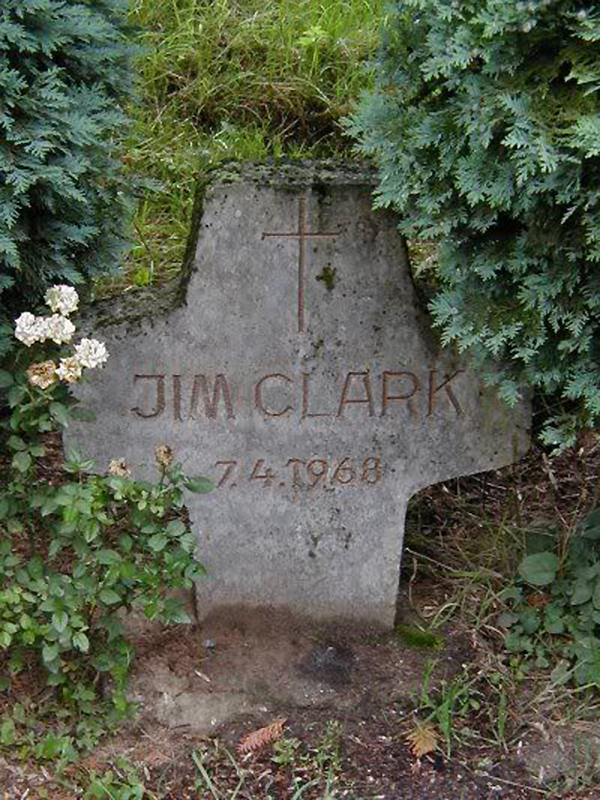 Jim Clark’s burial place in the Parish churchyard is easy to find, for a wooden bench has been placed close by, against one of the boundary walls. Even today, 50 years after Clark’s tragic death on the track, visitors still come to pay their respects. Modestly, Jim is described first as a farmer, and only then as the World Champion motor-racing driver of 1963 and 1965, Winner of 25 Grand Prix races and Winner of the Indianapolis 500 Race. Looking at his memorial, I suddenly realised how little I knew of the achievements of this Flying Scotsman, still so highly regarded, and made up my mind to buy a good biography. Among our many books at home, I’d found several on the history of motor racing, but only one on an individual driver, the Argentinian, Juan Manuel Fangio (1911-1995). I recalled often having seen Fangio described as the best racing driver who had ever lived, and wondered whether comparisons of this sort could really be valid, for I’ve also seen our own Jim Clark described in this way! 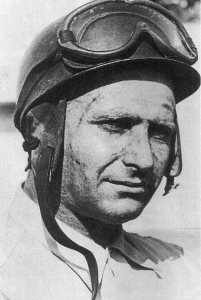 Known affectionately as the ‘Old Man’, Fangio had a relatively late start in Grand Prix racing, but he retired only in 1957 – at the age of 46 – by which time he’d won five World Drivers’ Championships and 24 Grand Prix races. Sadly, he had also seen during his career the deaths of more than 30 of his fellow drivers. Motor racing was an extremely dangerous sport in the 1950’s, and remained so into the 60’s, for few measures were yet in place to minimise the consequences of a crash. The term Grand Prix has been around almost since the start of motor racing (and racing of one sort or another since the invention of the motor car, the earliest competitors noted for their wealth as much as for their courage and daring). But the elite modern Formula 1 events date only from 1950, when the first race took place in England at the Silverstone circuit in Northamptonshire. 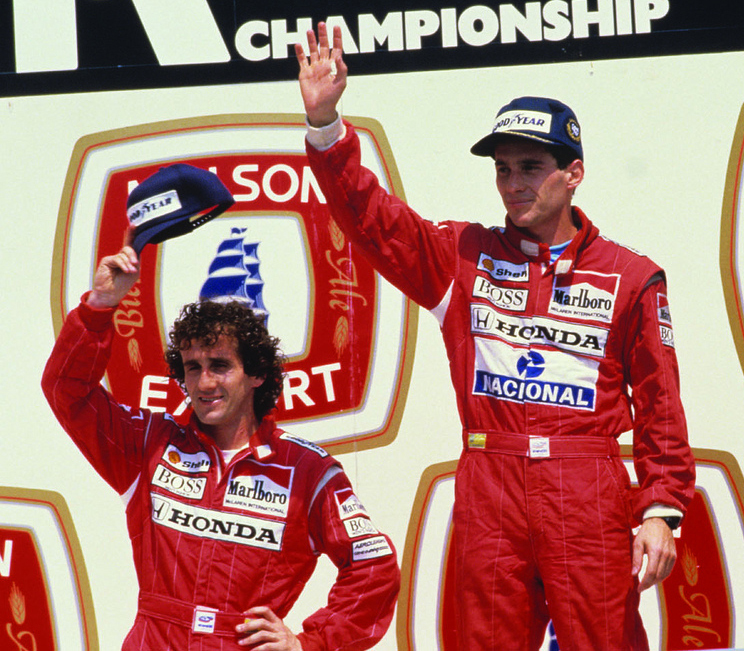 At this level, car and driver are both vital to success, in recognition of which a separate World Constructors’ Championship and World Drivers’ Championship are contested each year. The rules surrounding Formula 1 are tremendously complex, I would guess, varying not only from year to year, but even from one circuit to another. Most people, I suspect – myself included – know very little of the detail, only having seen these exciting races on TV. 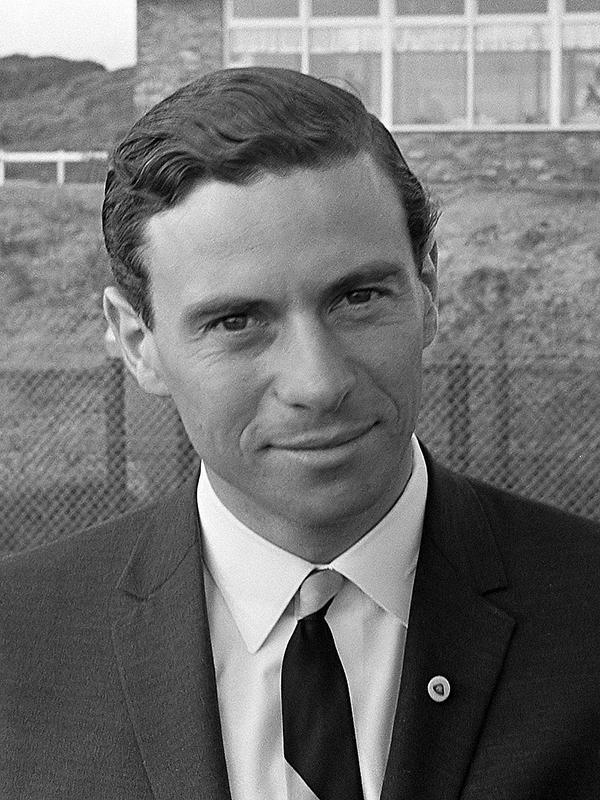 Jim Clark triumphed in the Belgian, British and USA Grands Prix of 1962, those three victories placing him second in the Drivers’ Championship that season. 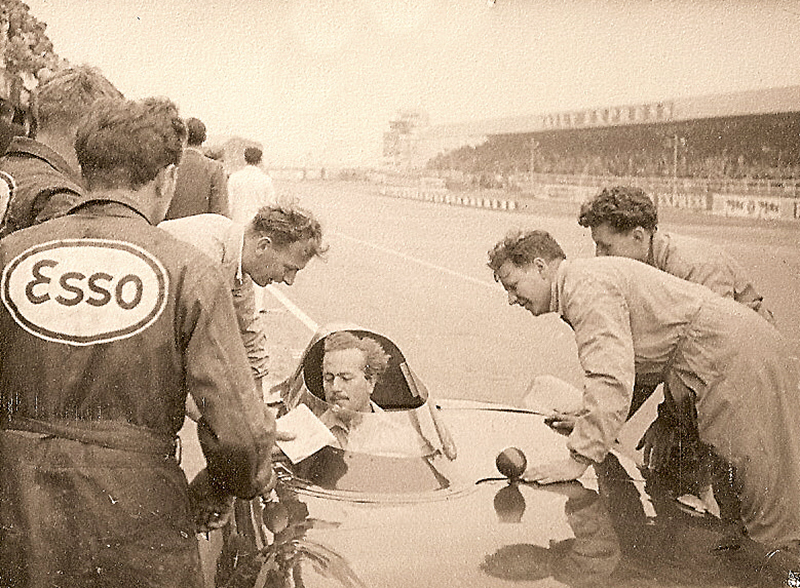 In 1963 he won an astonishing seven out of the 10 Grands Prix – and his first World Drivers’ Championship. Two years later this achievement was duplicated when Jim won six Grands Prix and a second World Championship title, his success crowned by winning also the Indianapolis 500 race. In both seasons he achieved the highest possible Championship score of 54 points. Clark’s failure to win every race, every time, is not to suggest for a moment that he was an inconsistent driver – in fact the precise opposite is the case! On the basis of my reading – I did say that I was no expert – Jim tended to start at the front (having achieved the best times in the qualifying heats), and to hold and indeed increase his lead as each race progressed. And he tended to win – provided only that his car did not misbehave. The possibility of mechanical failure is an abiding problem in motor racing, I’d guess, for every part of the lightly-built vehicle is under intense pressure. Engines reach 9,000 rpm. There is continual innovation on the technical side as the engineers seek to improve their cars, and – inevitably – little time for testing. Breakdowns seem to have been common in the 60’s, and a splendid story I found online illustrates how Fangio could often take these in his stride. Driving for Maserati at the Nurburgring in the German Grand Prix of 1957, he had lost almost a full minute following a pit stop. But he came roaring on to the track, breaking the lap record and passing the leading Ferraris to secure victory and win his fifth World Drivers’ Championship. Absolutely thrilling to watch! Jim Clark demonstrated that same dazzling ability during the US Grand Prix of 1963 at Watkins Glen, New York. Delayed at the start by – of all things – a flat battery, he found himself more than a lap behind. Undeterred, he set off at a cracking pace, fighting his way through the field to reach third place as the race ended and, predictably, setting a new lap record for the circuit. Only the greatest drivers, I would think, can rise to the occasion in this way, calling upon deep reserves of sheer natural talent. What other explanation can there be? 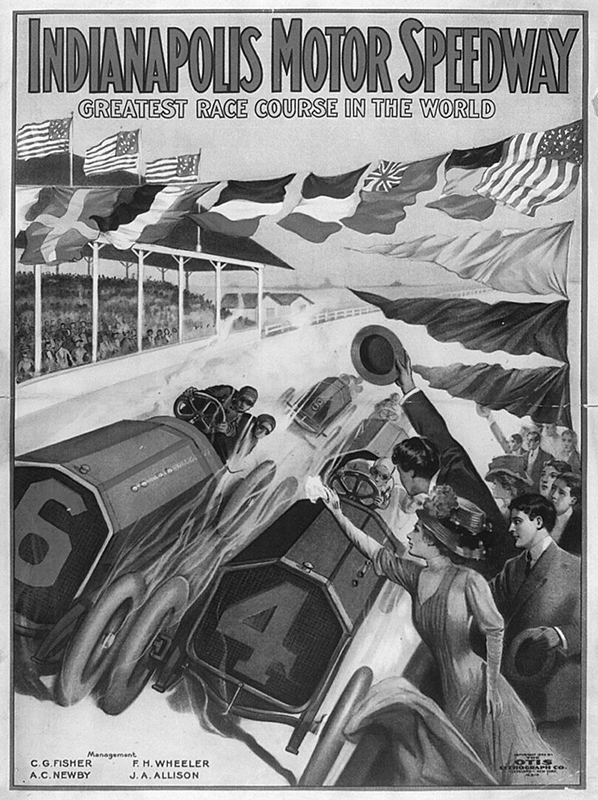 The Indianapolis 500 is a uniquely American race, dating – under one name or another – from 1911. Promoted as The Greatest Spectacle in Motor Racing, I read at Wikipedia that the lap record stands today at an average of 237 miles per hour – set in 1996 by Arie Luijendijk (b.1953), the ‘Flying Dutchman’. An astonishing speed, assisted no doubt by the simplified layout of the track, a huge rectangle with just four bends. Two hundred laps of this exciting Speedway give the ‘Indy 500’ its name. 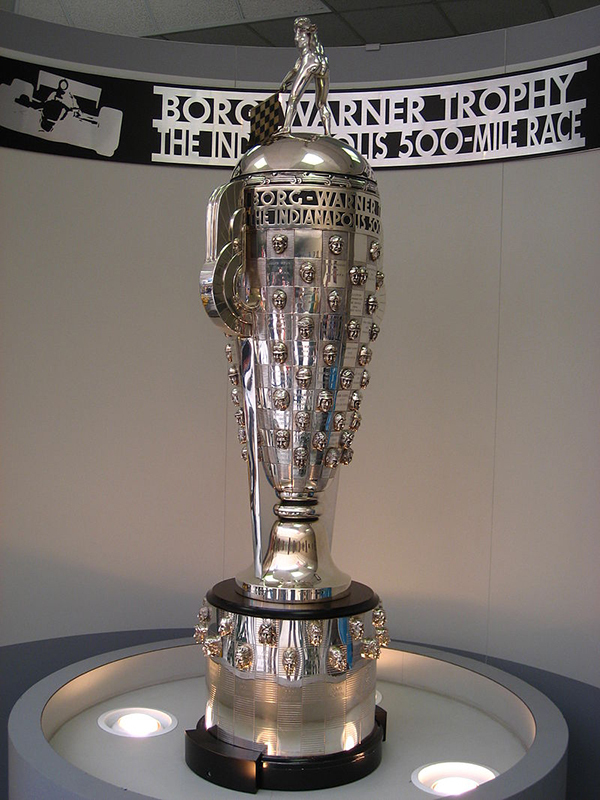 Before Clark, no European driver had won at Indianapolis since 1916. 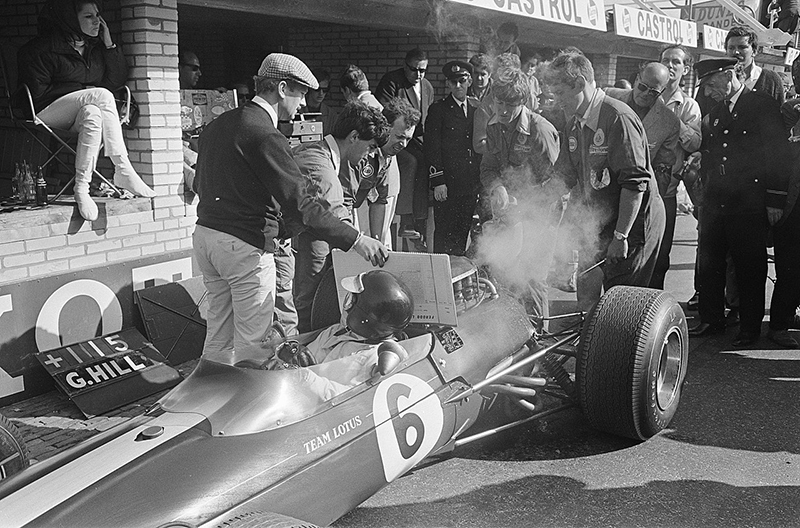 According to the rules, Jim Clark ought to have been declared victorious in 1963 when the car of the leader, Parnelli Jones, began to spray oil on to the track, meaning disqualification. But the American had led for most of the race and was a popular winner; neither Clark nor Lotus chose to pursue the issue (Jim raced almost exclusively for the English Team Lotus). The tables were turned on Jones in 1965 when Clark won emphatically, finishing two laps – five miles – ahead. He’d covered the 500 miles at an average speed of just over 150mph, so you can see that this represents more than three hours of intense concentration. Only 11 cars from the original 33 survived that tough race. Clark’s Lotus 38, a rear-engined car, had benefited from another new Ford engine, and Ford’s gained much valuable publicity. “This thing, at 9,000rpm, all screaming and banging and thumping around behind me, is fantastic.” There was a kiss on the cheek from Miss Indianapolis 1965, Suzanne Devine, and the magazine Time reported that Clark had politely shaken the young lady’s hand! 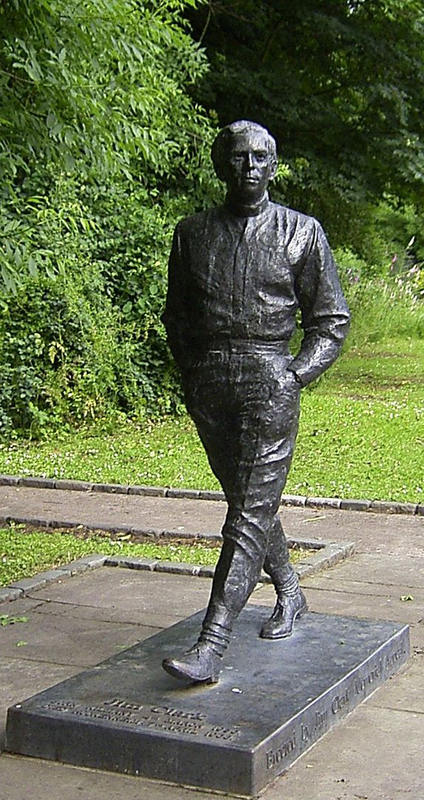 Jim Clark memorial marker at the location of his fatal crash Roger Higton Pinterest. 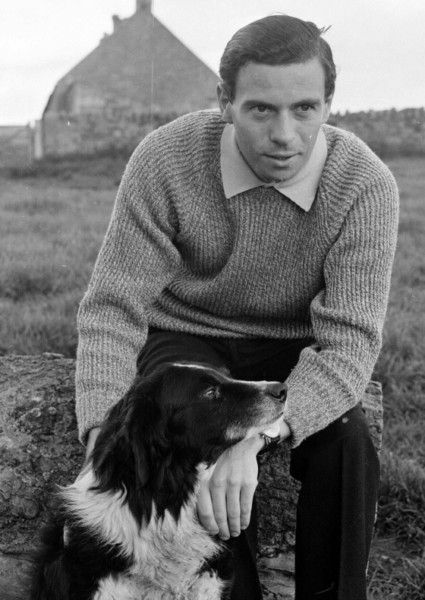 News of Jim Clark’s death on 7 April 1968 reverberated around the world, for the Scots driver’s name was known and respected on every continent. On his fifth lap of the Hockenheim circuit in Germany, Clark’s Lotus 48 shot off the track at tremendous speed, slamming side-on into the trees. Jim suffered massive injuries and died before he could be taken to hospital. With so much ahead of him, his life had been cut short at the age of just 32. An inquiry revealed that one of the rear tyres of the Lotus had disintegrated, the damage caused by a piece of metal debris almost certainly picked up during the preceding lap. (It seems that this fragment had lain undiscovered on the track for a few days.) A small, cruciform stone was placed at the spot where Jim Clark’s car crashed, fortunately quite far from where there had been any spectators. That this terrible accident was due to no lapse or error on Clark’s part, and that it occurred during a relatively unimportant Formula 2 race, served only to make the tragedy harder to bear. 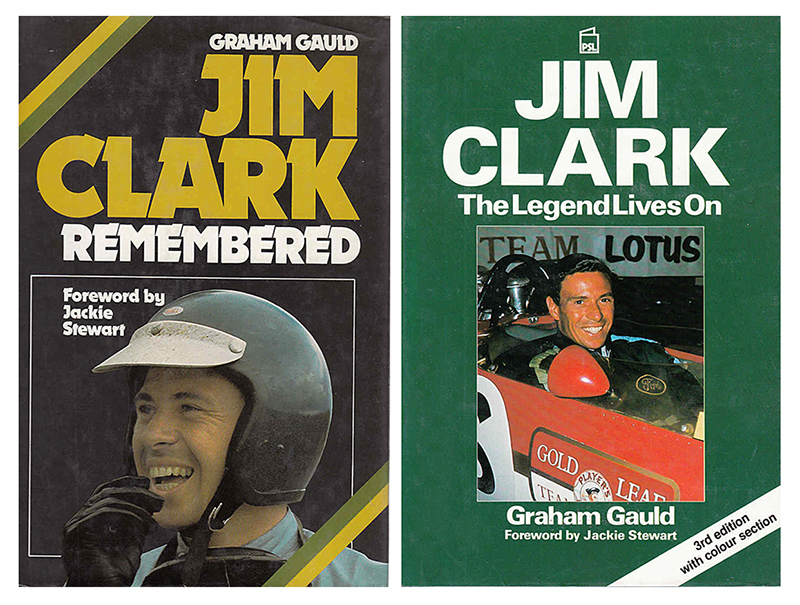 Jim Clark’s death had a profound effect on his racing colleagues. If Clark, our leader, could die in this way, they reasoned, so too could any one of us. Their campaign for improved safety measures, begun some years earlier by such drivers as Sir Jackie Stewart (b.1939), received an added impetus from that black day at Hockenheim. Today, steel nets and walls of rubber tyres catch any car that leaves the track. Jackie Stewart at the 1969 Dutch Grand Prix. 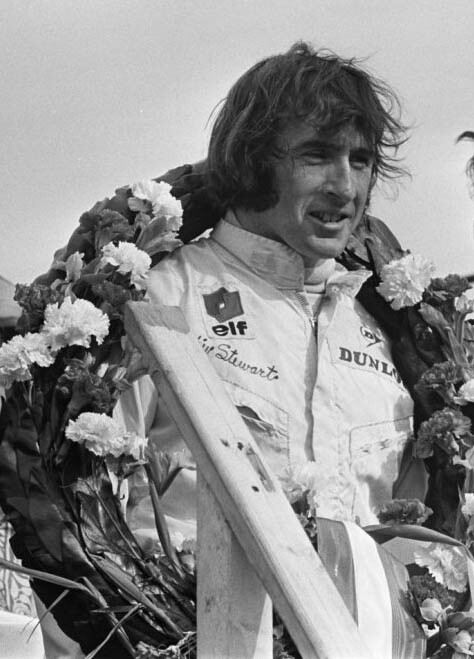 Jackie Stewart went on to equal or surpass Clark’s record, winning the World Drivers’ Championship in 1969, 1971 and 1973 (and being placed second on two occasions) – achieving altogether 27 Grand Prix victories. Isn’t it remarkable that a small country like Scotland should produce, in the space of a few years, two outstanding champions? 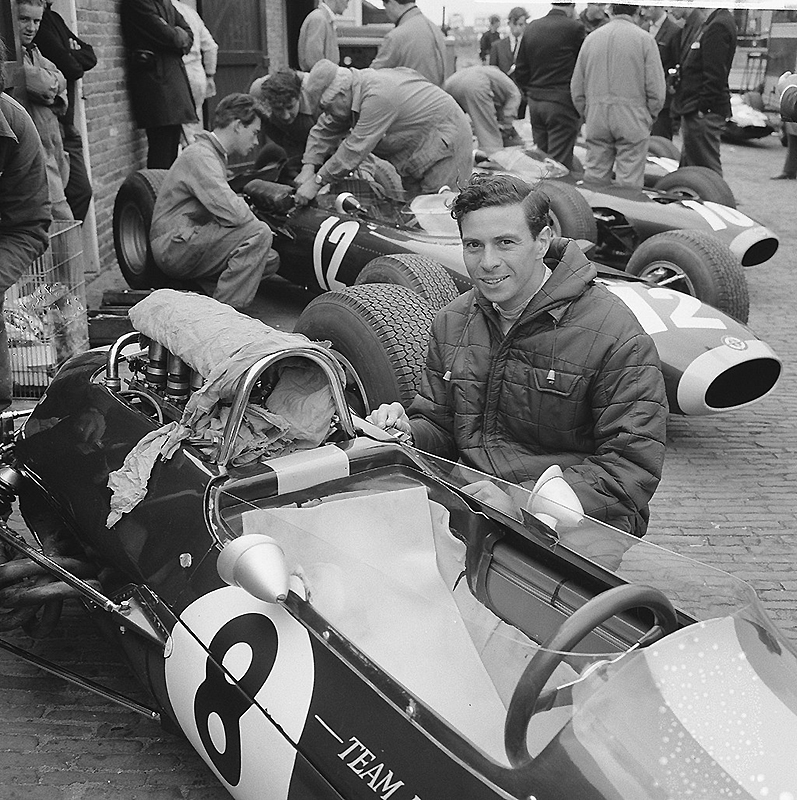 Jim Clark inspired generations of younger drivers. The Brazilian, Ayrton Senna (1960-1994), another of the greats of Formula 1, travelled to Scotland in 1991 as World Champion on a pilgrimage to honour him. Senna visited Chirnside and Duns, of course, but also Musselburgh, where Loretto School is situated, for here Jim Clark boarded from 1949-52. Each week, we’re told, Jim looked forward eagerly after his lessons to devouring the new motor-sports magazines. 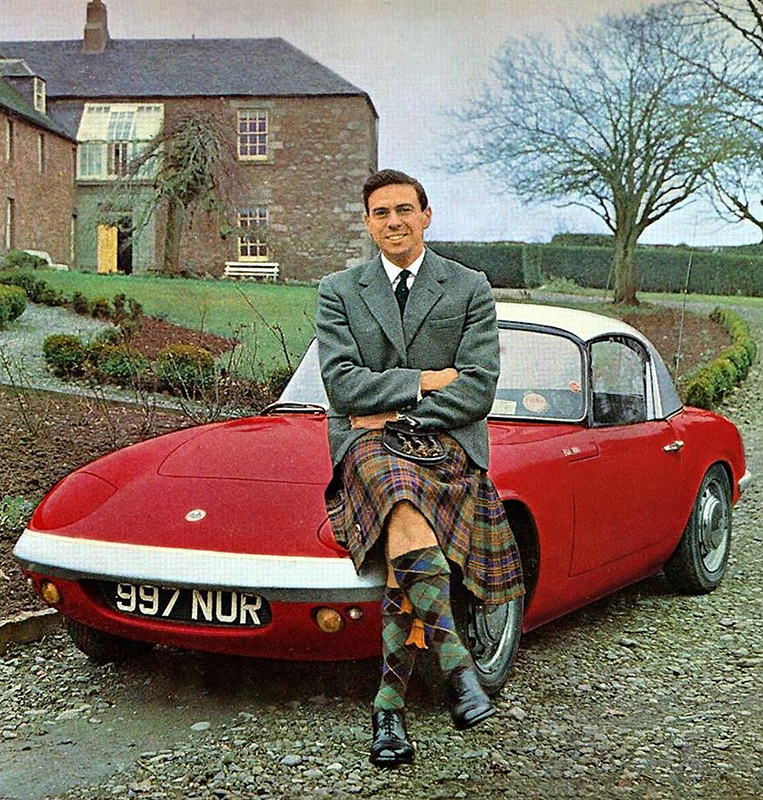 Loretto has a strong Christian ethos, and this is how Jim Clark was brought up. A carved wooden plaque in the school Chapel commemorates the life and achievements of this former pupil ‘whose name rang around the world’. In later years, despite a busy international lifestyle, Jim took his place in church each week whenever he was at home. 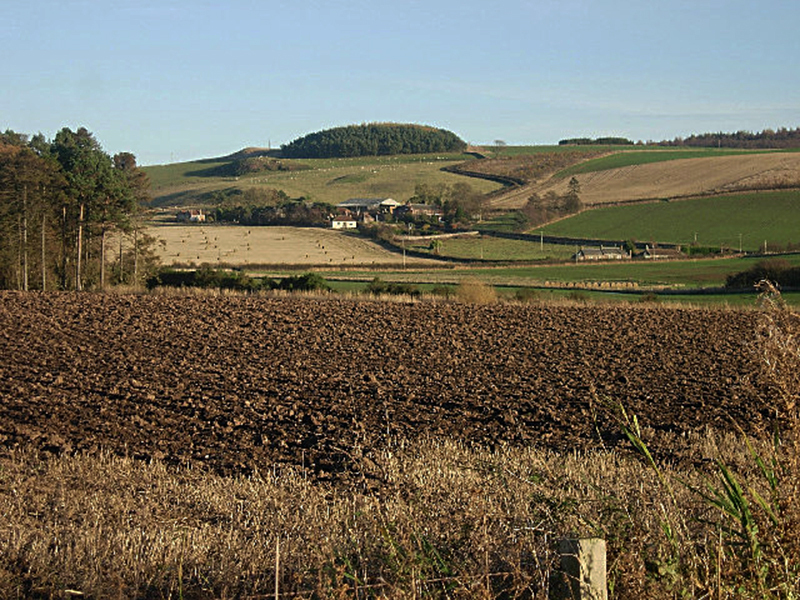 Although Clark will always be associated with the Borders, he was in fact born in Fife, the youngest and the only boy among five children. His parents had a farm at Kilmany (a village on the A92, about five miles north of Cupar), moving down to Chirnside in 1942 at the height of the Second World War. Jim was six. By the mid-1950’s, the young fellow had been given full responsibility for working Edington Mains, by no means a small farm (one wonders whether his father’s health was failing). In the 60’s, the enterprise ran to 1,242 acres of crops – about 500 hectares – as well as grazing for cattle and three flocks of pedigree sheep. Jim loved farming and the rural life, and fully intended to return to it after his retiral from racing. 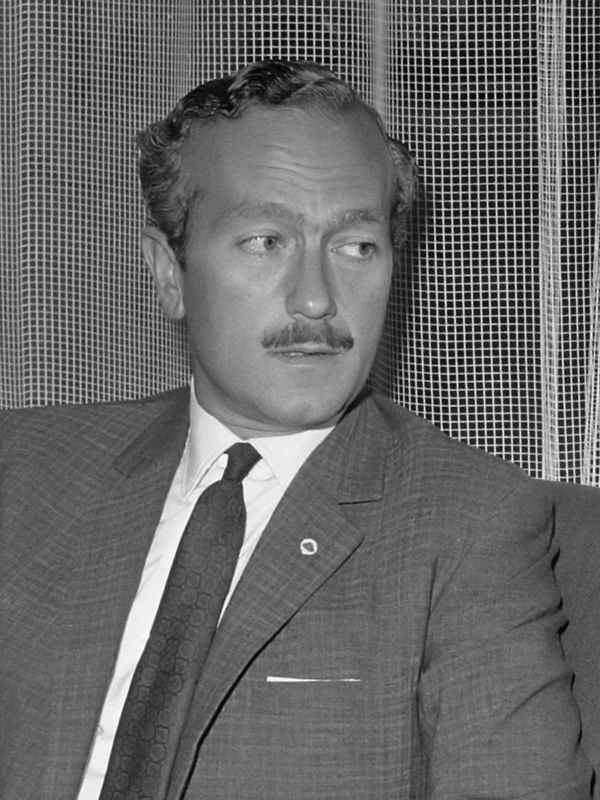 Colin Chapman was the designer and engineer behind Lotus cars, and had been an accomplished driver in his younger days. The level of mutual respect between Clark and Chapman was quite remarkable, and the two worked tremendously well together. I’d like to share with you, Janice, Marie-Agnes and Jean-Claude, part of Chapman’s tribute to Jim Clark, for I find it quite affecting : “No-one ever, before or since, will have such a profound effect on me .. we got on so well together .. I felt that Jim’s personal integrity and personal mode of life and values were fantastic. .. He was so thoroughly well brought up and so thoroughly well adjusted to life. There was so much good in him that it improved me in some ways.” Isn’t that splendid ? 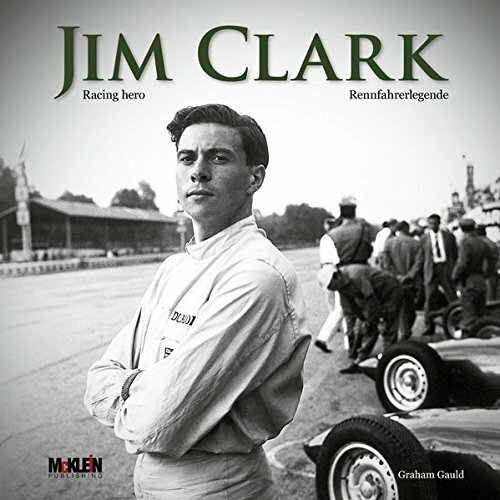 Graham Gauld’s book is not large (although the third edition includes eight pages of colour photos), and so I was happy to find so much on the ‘personal’ side of Jim Clark, the little things that bring him to life again for us. Clark has often been described as shy, and indeed in the early years he did find it difficult to be thrust under the spotlight. Nothing unusual in that! ‘Reserved’ would be a better term, Gauld suggests. Jim very quickly learned the wisdom of being at first a little careful of people. 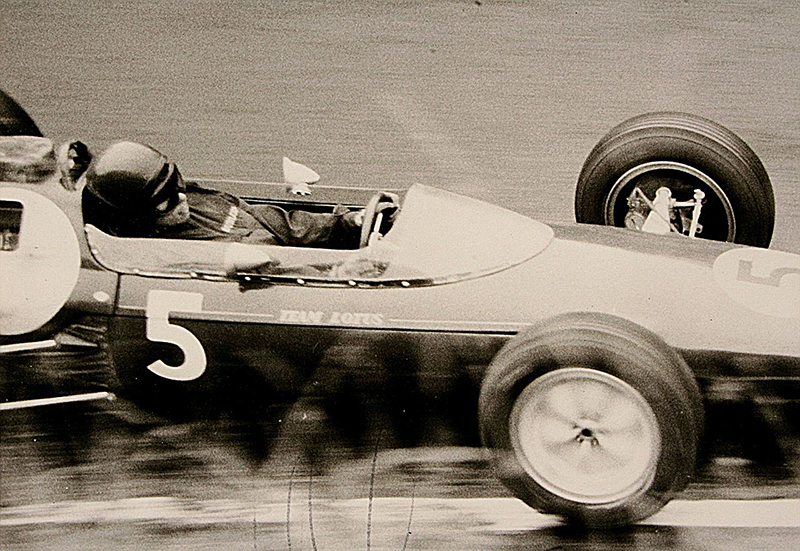 So, Jim Clark could apparently be indecisive in small things, but was that important? He was resolute in his determination that it was not fair to ask any girl to marry him while he continued racing, and who can say that he was not right in this? He might bite his nails and even nibble at his fingers while at the wheel, but Jim suffered from no lack of confidence in his own superior driving ability. For him, the puzzle was to understand why the others could not keep up. Clark was a private person who cared little for the glamour that surrounded Formula 1 racing. Such things as how he won a race mattered very much to him, for he had an acute sense of fair play. Modest in his demeanor, he wore success lightly – and these personal qualities endeared him to the public. Juan Fangio, I suspect, recognised in Jim Clark the same fine qualities of character that he himself possessed, and found in him ‘a man after his own heart’. 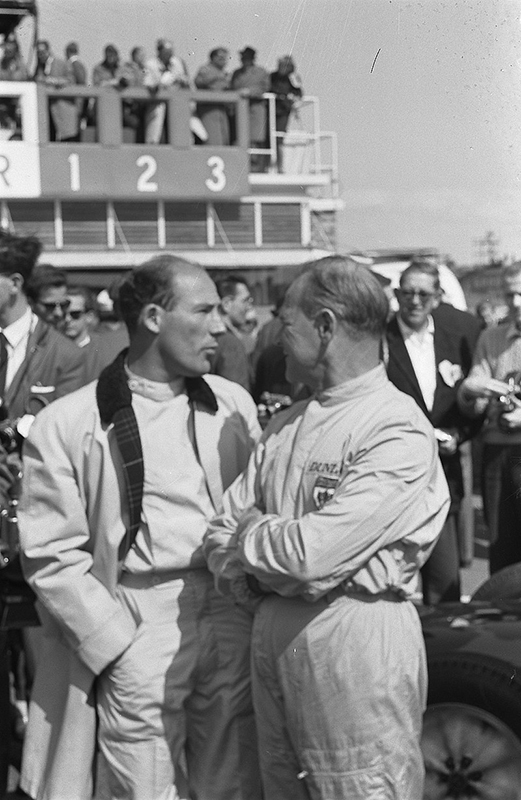 Speaking in retirement at Monza, scene of his greatest triumphs, Fangio gave it as his opinion that Clark had been the best driver of them all. Ayrton Senna – winner of 41 Grands Prix and three World Championships – saw it that way too. 2 comments to Jim Clark Remembered .. Thank you for your excellent article “Jim Clark Remembered” as a small Boy I ad a fascination with Ayrton Senna who to me was a racing god.I read that Ayrton’s Hero was Jim Clark and he was a sheep farmer just like I was to become, this man became a new hero the green car that always led from the front and Indy 500 winnner! . I read everything and imagined what it was like . I made a small pilgrimage to Kilmany last year to stand at the side of the great man. A beautiful place where time seams to have stood still since the time of giants such as Jim Clark ruled the racing world. There was not a breath of air it was almost silent I looked at his face and imagined how it was. Very moving indeed . Thank you david. It is we, David, who must thank you for your kind words. It’s very encouraging to all of us at Scotiana to receive Comments like this! 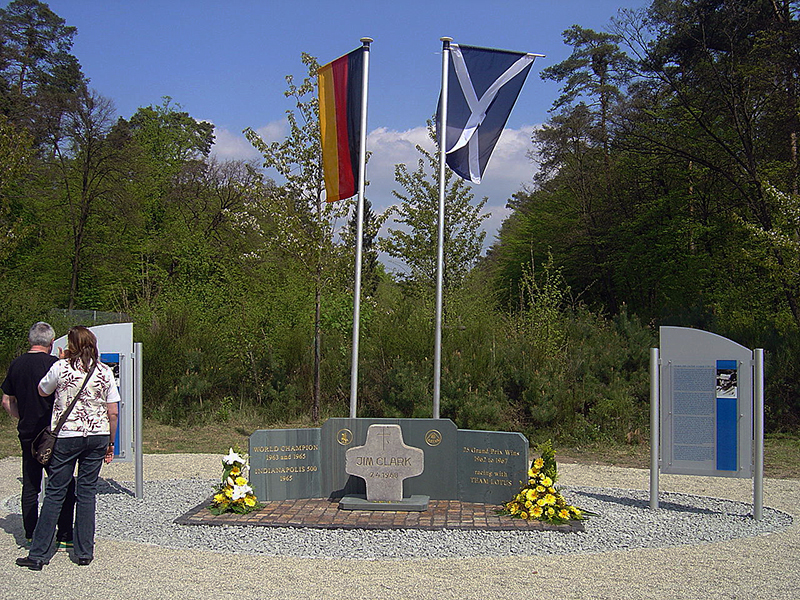 The Memorial at Hockenheim, inaugurated on 26 April 2010, is composed of green slate panels with a gold inscription, and incorporates the small stone originally placed at the site of Jim Clark’s fatal crash.